Tara, Mag Stock Market Tayo! 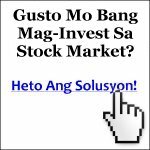 Marketing people in the Philippines are wondering how to make money online. One way of doing this is by using the principles, strategies, and tactics of online marketing. You might be interested in earning a passive income through online advertising revenues. Or perhaps you are targeting direct response sales through the internet, where you promote your company’s products or services. In other cases, you might also be an educator or trainor who is focused on providing knowledge transfer through internet or web-based distance education. Or quite simply, you have an advocacy that you would like to spread to as many people as you desire. Whatever goal you might have, for as long as it involves reaching people through the power of the web, online marketing is for you. And that’s why Viloria.net contributes to the improvement of the Philippine economy, by providing tutorials on online marketing for Filipinos. Of course, this being the web, everyone around the world is invited. While the tutorials will mainly be in English, there will be some information which will be presented in Taglish (Tagalog + English) or Filipino. Now that we’re on the subject of Filipino, this Online Marketing Philippines site is not only about making money online. This site will also feature some aspects of life in the Philippines, and will reveal various facets of Philippine culture. You will also get to know about different Filipino bloggers, and even Philippine blogging events. To see the latest additions to Viloria.net, simply look at the rightmost column, and you’ll find the Recent Posts section below the Search box. What’s great about online marketing? You’ve probably seen how more and more people are spending time online. And folks are using search engines such as Google, Yahoo, and Bing more today than they did in previous years. Wouldn’t you like to reach those people? Wouldn’t it be to your advantage if you could connect with them? That’s where online marketing comes into the picture. As you go through the various pages in this site, try to see what internet marketing techniques are being used. How do people make money with online advertising? Some Pinoy bloggers or Filipino internet marketers publish webpages that attract visitors. In some cases, advertisers pay these bloggers or online publishers so that their advertisements appear in their blogs or webpages. Some advertisers pay the online publisher directly. Others pay a third party online advertising broker, who then shares a percentage of that payment with the blogger or internet marketer. Your online income will depend on how much the advertiser pays, which depends largely on the quality of your site visitors. If your visitors end up buying the products or services of those advertisers, then logically, the advertiser will pay for more ads in your website. That’s why it’s not just about “blogging.” You need to inject marketing into what you publish online. How do we sell more products or services online? Sometimes, it’s not just a matter of pushing your products online. Of course, if your product or service is that good, and hordes of people are searching for it, then go ahead and build a product website and use that site to get orders online. But what if your product is not that well-known? In such cases, you will need to build your brand. Not just your product’s brand, but YOUR brand. In other words: Your Name. If people search for your name online, what will they find? Will the things you’ve published online position you as an authority in your niche? As a solutions provider who can be trusted? As you probably realized a long time ago, it’s not what you know but who you know. This means you will also need online marketing to promote your NAME. From the above, you will get the sense that you can use the internet in many ways for your company. There are different approaches, and certainly at least one of these paths will appeal to you. Before you know it, you will discover that success on the internet springs from a genuine desire to first be of help to others. There is a growing community of Philippine netpreneurs who are able to earn dollars without having to fly abroad leave their families in the Philippines. In a sense, that makes them online OFWs, with the difference being that they are able to spend more time with their children right here in our country. There are, for example, Filipino virtual assistants in different parts of the Philippines who perform internet marketing tasks such as writing, online article directory submission, website programming and design, search engine optimization (SEO), blog promotion, video marketing, Facebook fan page marketing, social media optimization (SMO) and other activities that support internet marketers. Of course, there are also some Pinoys who have become direct response internet marketers, and are selling their own products online. Some have even built a vast social media presence (in Twitter and Facebook, for example), supported by thousands of engaged fans. Whichever group you look at, one thing is clear: internet marketing is a skill that companies in the Philippines and the rest of the world need and want. It’s up to you to decide what you want to do with your own skills. From what we’ve seen, those with a strong desire to succeed, plus the motivation to put what they’ve learned into action, have what it takes to become top-notch online marketers. Thank for you visiting Online Marketing Philippines here at Viloria.net, and may you have a profitable and fun experience as you get to know about the Philippines, various Filipinos (and potential Filipino virtual assistants), and doing business with the help of the internet.